Gwynnett St. | Lunar Camel Co. Here is yr green drink. You know, for St. Patrick’s Day. I got my green drinking out of the way early so I can spend the day itself indoors with other green things of my choice, away from festive novelty hats and the fluids so vivaciously discharged by people wearing them. Anyhow, this drink was one of the nicest I’ve had in a long while. 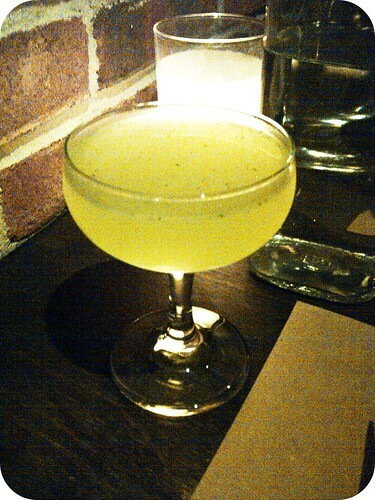 It’s called a Wadsworth and it’s made with gin (Beefeater), Luxardo Triplum, lemon, green chili, and coriander. It’s greener in taste than appearance and very well-balanced, and you ought to go have one. 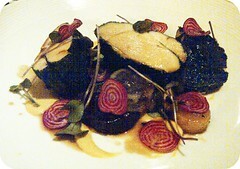 It’s at a restaurant called Gwynnett St. in Brooklyn and I had such a nice dinner there yesterday. The place isn’t new but I hadn’t heard of it before; I was just walking around after a Thing nearby and there it was. I think it’s an excellent choice if you should find yourself hungry and in or near Brooklyn. 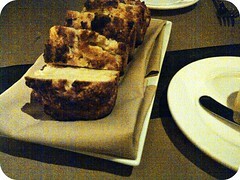 I had whiskey bread and chicken. The bread was terrific. I’m not sure I would’ve been able to decide it had whiskey in it had I not known in advance, but it would be interesting to try it again with a whiskey-based drink for accompaniment. I’m not normally an orderer of chicken but I was drawn to this one because ash was listed as one of the ingredients. Our waiter explained that the meat is brined and then coated with a mixture of smoked hay ash, garlic, and (I think) grapeseed oil. I would order pretty much anything with hay in it. It’s lo-fi, and I am famously into that. Hay, leaves, sap, or grasses, yes please. This was very, very good. Smoky, yes, though less so than my friend’s equally-delicious striped bass with smoked oyster cream. The deep garlic savoriness reminded me of Hide-Chan’s black garlic ramen, but it wasn’t pungent such that I felt like I needed to go into hiding afterwards. (Doubtlessly the beet and brown butter vinaigrette helped there). The hay gave it bonfire qualities without the barnyard-y note dishes like this sometimes have. This was more urbane-pagan than chef-daydreaming-of-farming. As long as we’re on the subject, I feel compelled to admit — is this why I brought this subject up? — I’ve been thinking about reviving my food blog. There are a number of reasons why it’s sort of a perverse time for me to do so, and yet I think it may be inevitable. I have so many other things I ought to be doing right now (very much including this blog) but I tend to get more things done when I have more things to do. If I add one more to my list, I might be able to finally make some real progress with those other things, along with the new (old) thing. I’ve got a new iPad that was just delivered today, which should be a tremendous help in terms of blog-infrastructure. Things I can do from bed or beside a turtle pond are far more likely to get done than things that require me sat at a desk. I also have a healthy backlog of material to get re-started with, having continued mentally food blogging during the entire dormant period (and having snapped plenty of photos and made plenty of notes too, just in case the secret mental blogging became unsatisfactory). I hadn’t looked at the list of e-mail subscribers to that blog in many, many months until yesterday, and there are now more people on it than there were when I was writing the thing. The newest was from this Tuesday! Knowing that people are waiting around for words I’m not producing makes me feel devious. UPDATE: If you’d like to see a well-lit, technically perfect photo of that deliciously lo-fi smoked hay chicken, there’s one in the New York Times review of Gwynnett St. that just came out today (April 4, 2012). Wells liked the food a lot but thinks that “[m]ore attention to lighting in the dining room would flatter both the food and the faces.” As ugly as my BlackBerry photos above are, I disagree. I’d much rather have a sexily dim dinner than an easily-bloggable bright one.